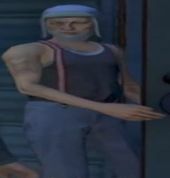 Curtis Weaver is a character in the HD Universe who appears as a minor character in Grand Theft Auto V. His voice actor is not credited. Curtis Weaver was born in Liberty City in 1954 and at some point participated in a protest in The Exchange, Algonquin and beat up a police officer with a fire extinguisher, which resulted in Weaver being sent to prison. He was later released and began living 'outside the system' in Dignity Village in northern Blaine County and states that he has rejected capitalist society. He was later arrested and bailed by Maude Eccles before failing to return for trial. Maude then hires Trevor Philips to apprehend Weaver, although Trevor can kill him. If Weaver is apprehended on the way to Maude's trailer he talks about Trevor's father with Trevor stating that he burnt down the mall where he was abandoned by his father resulting in Weaver deciding to stop talking. This page was last modified on 6 April 2014, at 15:55.